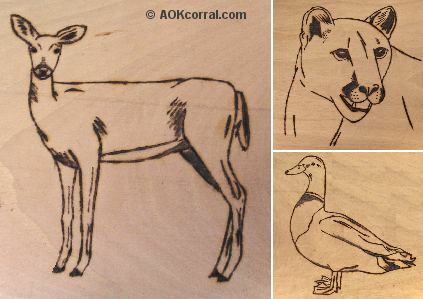 Enjoy using this collection of wildlife patterns for your next wood burning project, painting or craft project. Great designs to add to a rustic sign for the duck hunter or wildlife enthusiast. Bonus: The Easy Print Version contains: All wildlife patterns, doe, cougar, and duck; in small, medium, and large sizes. © Copyright 2009 by AOK Corral Craft and Gift Bazaar All rights reserved. Rub the back of the pattern with a pencil. Make sure that the back is covered with plenty of dark pencil rubbing. Lay the pattern onto your wood and then trace the lines of the design while being careful to hold the pattern in place. Preheat your wood burning tool and test on an extra piece of wood. Follow the lines with your wood burning tool. You may want to adjust these designs or add to them as you like. Try using one of these wildlife patterns on a welcome sign, duck hunting sign, or personalized sign for the hunter or outdoor enthusiast that you know. © Copyright 2009 by AOK Corral Craft and Gift Bazaar. All rights reserved. *This version includes patterns for doe, cougar, and duck; in small, medium, and large sizes.